Ishimura, a native of Tokyo, Japan, earned her Bachelor of Fine Arts degree from Tama University (in Japan) and a Master of Fine Arts degree from Texas A&M University-Corpus Christi. Inspired by the dialogue with her roommate and her own upbringing, Ishimura is bringing her Eastern experiences to the Western world with a proposed ceramic based sculpture that pulls elements from the countries of China, Korea and Japan. “My project will explore the commonalities and divisional perspectives among the three countries to challenge cultural ambivalence,” noted Ishimura. Not only will students benefit from the cultural conversations that will undoubtedly arise from viewing the final public art piece, but students in the art programs will have the opportunity to be immersed in the process. “Through [this] whole process, students will gain the techniques for building public art,” said Ishimura. Ishimura brings the experience of three solo and two-person exhibitions as well as many group exhibitions and teaching appointments. Arkansas Tech students wouldn’t have the opportunity to work alongside Ishimura if not for the work of Dr. Jeff Woods, dean of the College of Arts and Humanities and Dr. Dawn Ward, professor of art. “They applied for a grant from the Windgate Foundation that covered multiple new initiatives to the ATU campus,” noted Neal Harrington, professor of art and Norman Hall Gallery Director. ATU saw this first initiative come to fruition in Summer 2018 during the “Teacher Intensive Workshop” that brought together art educators from across the state. The Windgate A.I.R. (Artist-In-Residence) section of the grant was the next important initiative to execute after the workshop. Harrington believes that the artist-in-residence program is a very positive step in the direction for the art program at ATU. “Getting feedback and giving feedback to young artists can inspire, motivate, and solidify an undergraduate’s resolve to make art professionally,” he said. Truly Ishimura’s experiences at Arkansas Tech will be symbiotic. She’ll practice her discipline, create a new work, get feedback from others and experience new interactions with other professional artists. 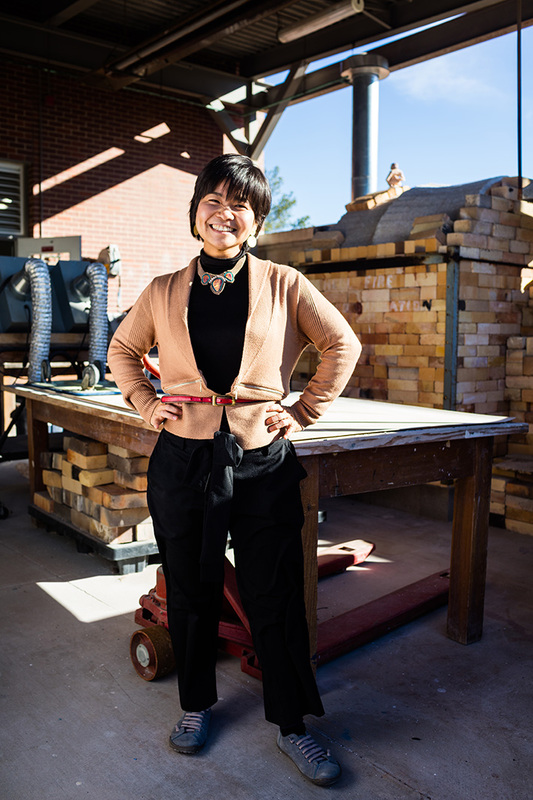 Arkansas Tech’s students and community will benefit from a beautiful new piece of public art, fresh cultural perspectives and hands-on learning from a practicing professional.